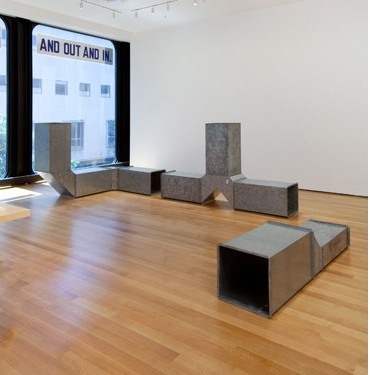 On view through October 5, 2009 at the Museum of Modern Art in New York is ‘In & Out of Amsterdam: Travels in Conceptual Art, 1960-1976,’ an exhibition that examines the beginnings of conceptualism and the role that international travel – in this case, particularly between Amsterdam and Los Angeles – played in shaping the movement. 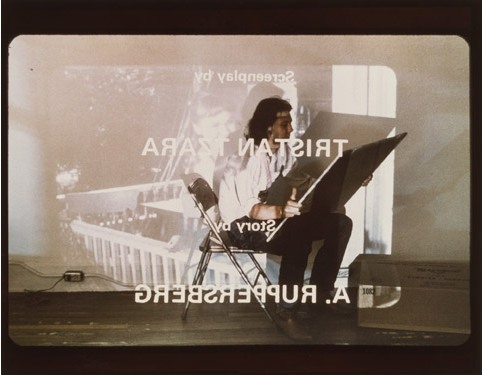 The exhibition includes ten American and European artists, from heavy-hitters such as Sol LeWitt and Lawrence Weiner, to the mythologized, like Bas Jan Ader and Stanley Brouwn, to lesser-known and peripheral figures such as Charlotte Posenenske. 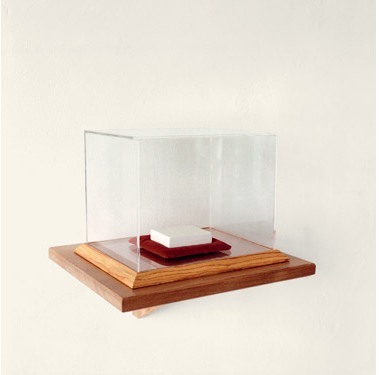 The focal point is the now-defunct but highly influential Amsterdam gallery Art & Project. 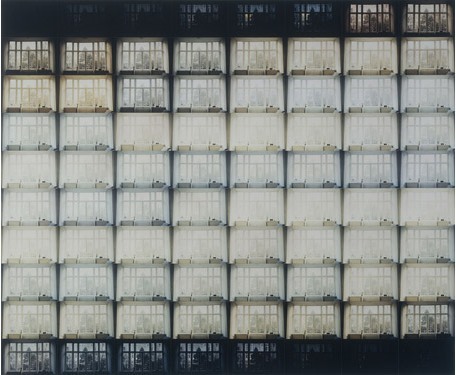 Founders Geert van Beijeren and Adriaan van Ravesteijn gifted the museum 230 works in 2007, which make up the majority of the 75 works that appear in the exhibition. 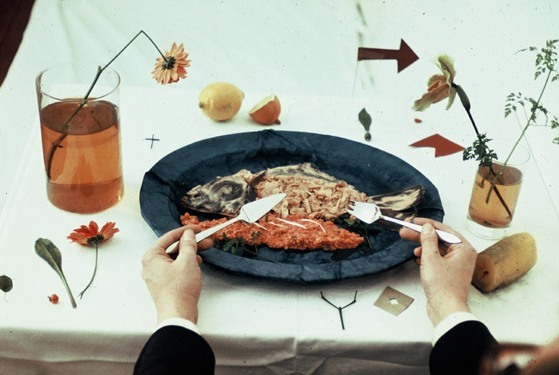 This exhibition builds upon MoMA’s influential 1970 exhibition, ‘Information,’ which helped cement Conceptual Art’s place in the art historical canon. 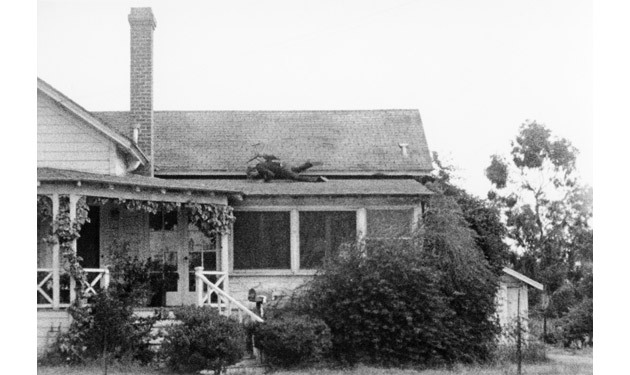 Several of the artists included in that first exhibition are reprised here. 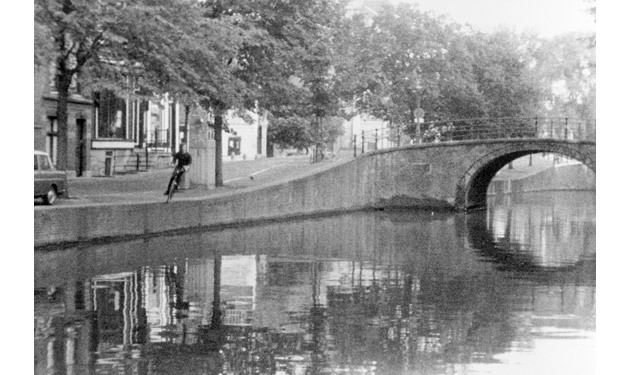 Amsterdam emerged as a nexus of Conceptual Art practice in the 1960s and 1970s due to a number of factors, including progressive social policies and a network of experimental museums and galleries. 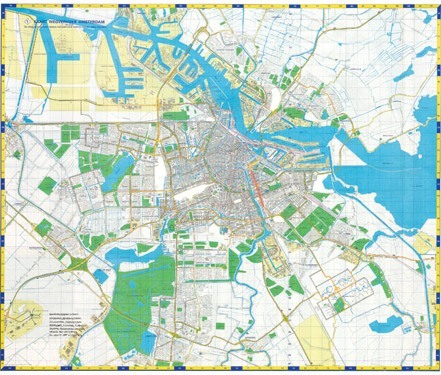 The artists included had many ties to each other in and out of Amsterdam. 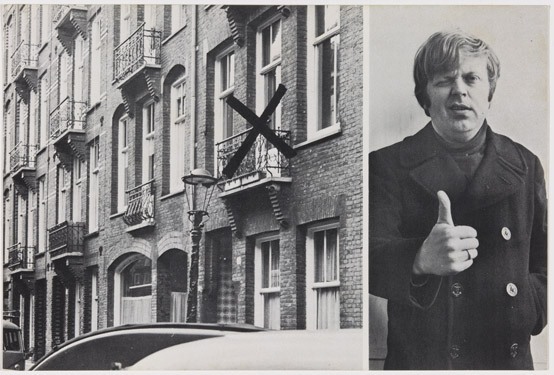 For example, Dutch artist Jan Dibbets met Gilbert & George at art school in London, while Ger van Elk and Bas Jan Ader studied in Los Angeles with Allen Ruppersberg. 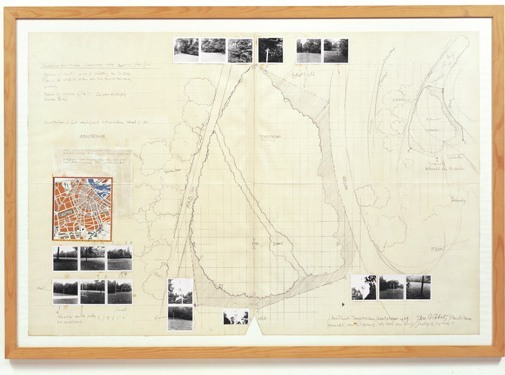 For a practice based on ideas rather than objects, the peripatetic nature of its practitioners played a large role in its development. Stanley Brouwn’s ‘This Way Brouwn’ is indicative of such an influence. Brouwn solicited directions from pedestrians, with the resultant artifact of the work a series of maps drawn by passers-by. 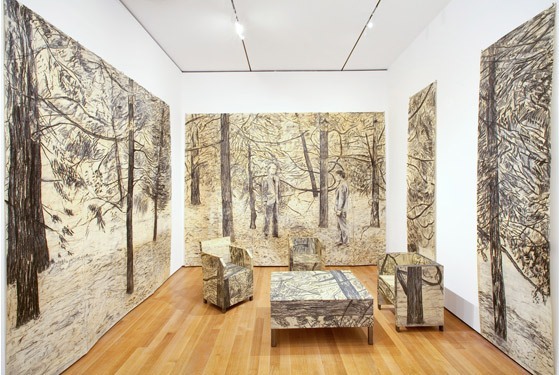 Gilbert & George’s installation ‘The Tuileries’ – charcoal drawings of a gay cruising scene in Paris – presents the illusion of travel. 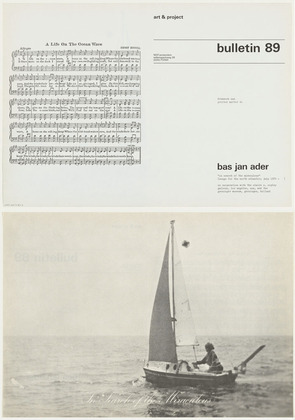 Most poetic, perhaps, is Bas Jan Ader’s ‘In Search of the Miraculous,’ which sees the artist walking with a flashlight alone on an LA beach at night and, ultimately, crossing the Atlantic alone in a small sailboat, vanishing, never to be seen again. The exhibition includes two site-specific installations by Weiner, one of which was commissioned specially for it: a series of portholes and red triple-x’s in Weiner’s signature typeface in the hallway leading to the exhibition, alluding to Amsterdam as a seafaring city and its notorious red light district. 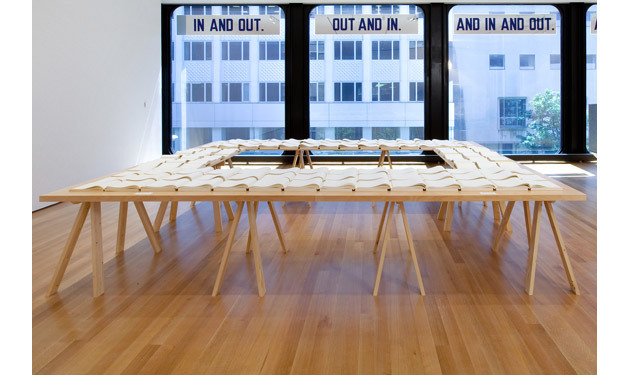 The second installation, from which the exhibition borrows its name, has the words ‘IN AND OUT. OUT AND IN. AND IN AND OUT. 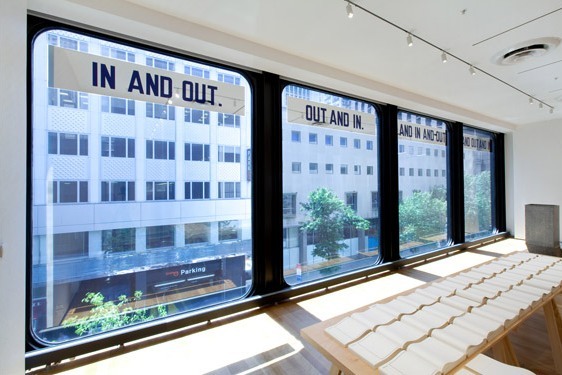 AND OUT AND IN.’ printed on the museum’s windows, overlooking the street. A related exhibition, ‘In & Out of Amsterdam: Art & Project Bulletin, 1968-1989,’ presents the 156 bulletins published by Art & Project. 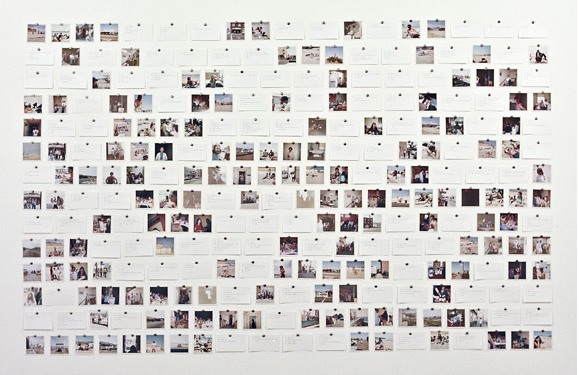 Each bulletin was a single-sheet mailer, designed by artists including all ten of those in the exhibition, as well as Alighiero e Boetti, Marcel Broodthaers, and others. 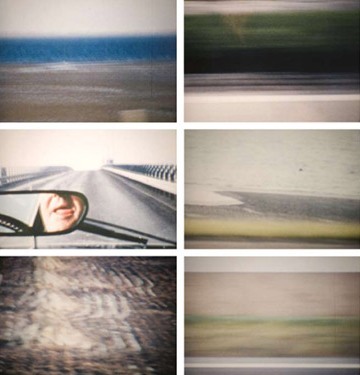 ‘In & Out of Amsterdam: Travels in Conceptual Art, 1960-1976′ runs July 19 – October 5, 2009 at the Museum of Modern Art in New York. Daily News (Los Angeles, CA) July 13, 2011 If transit officials have any advice for motorists over the “Carmageddon” weekend it is this: Go long! Officials say motorists may have to travel longer distances, but in the end will reach their destination sooner. This will be especially true for San Fernando Valley drivers trying to get over the hill and others trying to get into the Valley from the Los Angeles basin. “It’s a longer distance, but it’ll be a lot shorter in time travel than getting off the freeway and getting on those side streets,” said Chris Rider, spokesman for the Los Angeles Department of Transportation. “It’s going to be far less frustrating for people than when they’re in traffic that doesn’t move.” With the San Diego (405) Freeway to be closed for 53 hours between the Ventura (101) and Santa Monica (10) freeways, those trying to get to the Harbor Area or LAX will find their traditional route blocked. They are being urged instead to take the 101 to the Harbor (110) or 10 Freeway, or the Ronald Reagan (118) Freeway to the Golden State (5) Freeway to the Long Beach (710) Freeway. Those trying to get to the Westside can take the 101 or Foothill (210) Freeway to the 10 Freeway. For example, someone trying to get from Sherman Oaks to Westwood – normally a 17-minute trip, sans traffic – is advised to detour around the mess by taking the 101 south through the Cahuenga Pass, transitioning to the 110 south, then the 10 west. The detour could double the traveling time, but it should still be quicker than being stuck on crowded side streets, officials said. For motorists trying to get out of the West Valley, Metro officials suggest taking Topanga Canyon Boulevard to Pacific Coast Highway. But the DOT has shied away from advising people to use canyon roads – such as Topanga Canyon, Las Virgenes, Decker Canyon and Kanan roads – to avoid creating traffic jams in residential neighborhoods. However, in preparation for the crush expected on PCH, Caltrans has removed K-rails from the southbound stretch between Temescal Canyon Road and Chautauqua Boulevard to open up that side of the road to two lanes. The K-rails were in place for a runoff diversion project. PCH will be opened up to three lanes until Tuesday morning. Other winding and narrow north-to-south connectors such as Beverly Glen Boulevard, Benedict Canyon Drive, Coldwater Canyon Drive, Laurel Canyon Boulevard and Cahuenga Boulevard also could be jammed. “I usually use Sepulveda if there’s a lot of traffic, but this weekend I’m going to avoid traffic by staying at home,” said Mona Kaddoura, 21, of Northridge. The 405 closure between the 10 and 101 freeways is expected to begin gradually from about 7 p.m. Friday as workers begin demolishing the Mulholland Drive Bridge overpass to widen the carpool lane. The freeway is expected to be reopened by 6 a.m. Monday, with contractors facing stiff financial penalties for missing that deadline. South side of Ventura Boulevard between Balboa Boulevard and Sherman Oaks Avenue. North side of Ventura Boulevard between Noble Avenue and Sepulveda Boulevard. Both sides of Sepulveda Boulevard between Greenleaf Street and Valley Vista Boulevard. West side of Sepulveda Boulevard between Valley Vista Boulevard and the 405 Freeway. East side of Sepulveda Boulevard between Moraga Drive and Ovada Place. Public transit options Public transit agencies are beefing up service this weekend to offer Angelenos an alternative to traveling around the Southland. Metrolink will add service on the Antelope Valley Line and also will operate the Ventura County Line, which typically doesn’t run on the weekend. Amtrak will offer half-price fares this weekend to passengers traveling between Union Station and Bob Hope Airport in Burbank. Metro will add 61 buses and 32 rail cars during the weekend closure, and also will offer free rides on the Red Line subway and on 26 bus lines. The Metropolitan Transportation Authority is offering a host of alternatives, with details available at www.metro.net/projects/I- 405. This entry was posted on Friday, September 11th, 2009 at 4:39 pm	and is filed under Go See. You can follow any responses to this entry through the RSS 2.0 feed. You can leave a response, or trackback from your own site.